An outdoor kitchen is a great place to entertain guests or enjoy family meals in the fresh air. While these kitchens tend to be used more often in summer, they can also be used at other times of the year if they’re designed properly. At Summerhill Pools, we design and install outdoor kitchens for Dallas homeowners who want to make the most of their outdoor living space. If you’re interested in getting an outdoor kitchen for your home, our design experts will gladly help you create the ideal kitchen for your wants and needs. Contact us today for a quote! When it comes to outdoor kitchen ideas, there is a wide range of options to consider. If you want an upscale kitchen that offers plenty of meal preparation space, consider installing a luxury outdoor kitchen that has a ton of features and amenities for you and your family to use. These kitchens tend to have streamlined designs and feature materials that are sleek, such as stainless steel or glazed ceramic tile. If you have limited space but still want to be able to cook and enjoy meals outdoors, consider creating an outdoor kitchen with a cozy setup. These kitchens are well-equipped but don’t take up a significant amount of space in your yard. A cozy outdoor kitchen might have a rustic look that’s achieved by using wood or stone or a more contemporary look. If you have any other ideas in mind for your outdoor kitchen, our experts are ready to listen to them and work them into our design plan. Our team at Summerhill Pools can help you navigate the many options that are available for your custom outdoor kitchen such as pizza ovens, outdoor griddles, or how about a turbo burner for a crawfish boil? We can help you select the right materials, layout, features, and design to make your outdoor kitchen a place that you and your family can enjoy using for years to come. You’ll find that there are many different outdoor kitchen designs and features to choose from, depending on the styles you like or the overall atmosphere and look you’re interested in. Our experts at Summerhill Pools in Dallas are here to help you select the features for your kitchen by walking you through the outdoor kitchen design process. Outdoor kitchen designs can range from rustic or naturalistic to ones that focus more on elegance and luxury. We can also design We can also design an outdoor kitchen with a more casual appearance that puts a strong emphasis on making outdoor meals fun. No matter what kind of design you’re interested in, our experts can come up with an outdoor kitchen plan that fits your vision. There is a range of features available that make it easier for you to prepare meals outside and entertain guests. Other features are meant to provide a comfortable outdoor environment for dining. From kitchen appliances and countertops to outdoor seats and lights for you and your guests, the experts at Summerhill Pools will help you choose the perfect features for your outdoor kitchen. 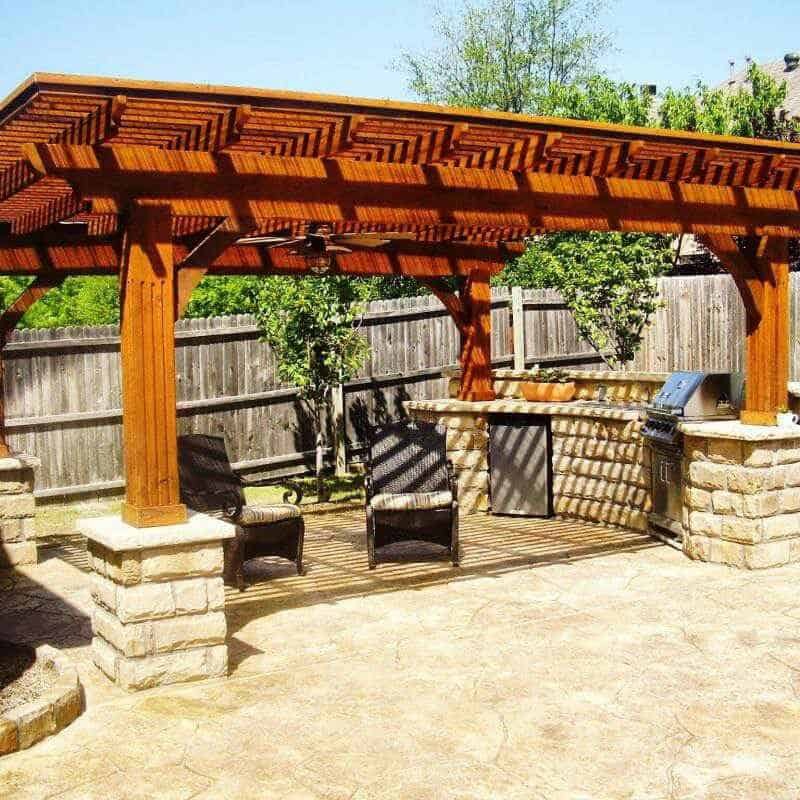 Don’t trust your outdoor kitchen project to just any Dallas contractor. If you want to ensure that your kitchen is built to your specifications and is constructed properly, count on the professionals at Summerhill Pools. As a leading outdoor kitchen contractor in Dallas TX, we provide all of our customers with exceptional service and stellar workmanship. Whether you want a small, cozy outdoor kitchen for you and your family or a spacious, upscale kitchen that can seat several guests, we’ll make sure that you get what you’re envisioning. Outdoor kitchens can be complicated to build, especially if they’re going to include a lot of features or intricate details. You can rely on the professionals at Summerhill Pools to deliver exactly what we promise, which is an expertly-designed outdoor kitchen that you’ll get to enjoy for many years. From the design process to the construction stage, our professionals are ready to provide you with high-quality work. At Summerhill Pools, our team has the right skills, experience, and training needed to construct outdoor kitchens in all shapes, sizes, and materials. We can provide you with valuable input on what you might want to include in your outdoor kitchen or what kinds of materials would best suit it. Contact us to get more information on our outdoor kitchens.